In a sleepy neighborhood on the outskirts of Dhaka stands an empty lot called the Jalladkhana  Bengali for "Butcher's Den." A courtyard, flanked by a red brick wall and lined with potted plants and marble plaques, leads to a small two-room building. Inside, it is quiet and tranquil; a few candles flicker. Kept there are tiny traces of an untold horror that took place nearly 40 years ago: a pair of broken spectacles, a sandal with its straps torn, human skulls and bones. "They speak," says Mofidul Hoque, a trustee of the museum that preserves the site, "of an immeasurable silence." No one knows the exact number killed during Bangladesh's bloody struggle for independence in 1971 when the territory of East Pakistan severed its unnatural bonds with then West Pakistan, a thousand miles away on the other side of India. 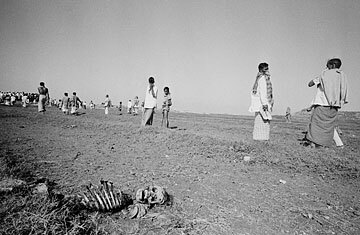 At the close of the Liberation War, as it's called by Bangladeshis, TIME reporters suggested the death toll was above a million. Ask people in Dhaka today and they'll tell you the true figure of Bengali civilians murdered by West Pakistani troops and death squads guided by collaborators was three times that. Bangladesh sits atop an alluvial plain, so those bent on genocide needed only to dump bodies in rivers or, as at the Jalladkhana, down the wells and conduits of local water-pumping stations, where corpses were literally flushed away into the sea. "These are crimes so horrible that even God wouldn't forgive you," says K.M. Safiullah, a retired general who led the independence war effort. "There cannot be unity without this being solved." Most of the last century's greatest atrocities have had a just, if painful, reckoning. The Holocaust found its redemption in the trials at Nuremberg, Rwanda's genocide in an internationally backed war-crimes tribunal, and some of the architects of Cambodia's killing fields are finally reaping what they sowed. More the shame, then, that possibly the most brutal massacre since World War II remains unreconciled at home and unremembered abroad. But today there's growing momentum in Dhaka for some sort of restitution. Since its traumatic birth, Bangladesh has weathered coups, assassinations and a legacy of largely corrupt and ineffectual leadership. Now war veterans such as Safiullah and other members of civil society are urging Bangladesh's current government, a caretaker administration of technocrats propped up by the military, to establish a fact-finding commission that could go about the long-overdue work of collecting testimony and starting prosecutions. In recent weeks, they've called for the banning of suspected war criminals and collaborators from the polls due to be held in December, but they face stiff resistance. The real authority in the country, General Moeen Uddin Ahmed, said earlier this year that the current period  as his regime overhauls the nation's politics and prepares for elections in December  was not the moment to sort out the weighty baggage of the past. Previous governments failed to prosecute suspected war criminals; others, amid a tangled mess of loyalties in the aftermath of the war, pardoned dozens of Pakistani officers. To this day, the war casts a deeply polarizing shadow, with many still suspected of having collaborated with West Pakistan's suppression of the East. In spite of this, or perhaps because of it, Ali Ahsan Mojaheed, general secretary of the Jamaat-e-Islami, a powerful political party that sided with Pakistan in 1971, thinks it's better to close the book on a tragic chapter in history rather than risk opening old wounds. After all, many who supported unity with Pakistan were also killed in reprisal attacks. "This is a dead issue," says Mojaheed. "It cannot be raised." Yet the sheer scale of the carnage cannot be denied. Sydney Schanberg, then the New York Times's South Asia correspondent, described the month-long Pakistani crackdown in March 1971 as "a pogrom on a vast scale" in a land where "vultures grow fat." (He would famously win a Pulitzer Prize for his reporting five years later on Cambodia's killing fields.) Passing through the charred husks of villages razed by West Pakistani troops, he heard whispered story after story of mass executions of Hindus, college students and anybody suspected of Bengali nationalism. Neighborhoods were gutted as Bangladesh's main cities fell to a fifth of their existing population; 10 million refugees fled west to India. Almost every Bangladeshi household has a tale of loss and suffering. Around 400,000 women, by some estimates, were raped. At the Jalladkhana, Hoque fights simply to keep the memory of those days alive. He reckons that there are thousands of other sites like this dotting Bangladesh's lush countryside. By one such spot north of the capital, he recalls, a stone epitaph erected there is inscribed with a bare message: "Passerby," it reads, "please stand here a moment."